Bernard Lacoste, who spent more than 40 years at the helm of the Lacoste clothing empire best known for its crocodile-embossed polo shirts, has died, the company said Wednesday. He was 74. Lacoste, who is widely credited with turning the family sportswear business into a major apparel company, died Tuesday in a Paris hospital, said company spokesman Philippe Lacoste, nephew of Bernard Lacoste. The family did not provide the cause of death, but said Bernard Lacoste had been suffering from a "serious illness" for more than a year. He stepped down as president last year. Bernard Lacoste succeeded his father, famed tennis player Rene Lacoste, as president of the Paris-based clothing manufacturer in 1963. 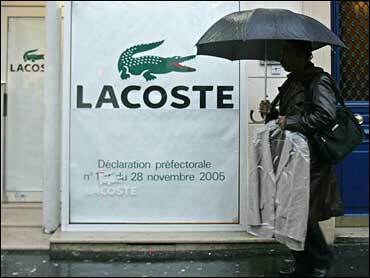 The Lacoste polo shirts adorned with the little crocodile have for generations been the company's staple. The famous insignia comes from the father, whose nickname was "Le Crocodile." The nickname apparently originated when Rene Lacoste admired a crocodile suitcase in a store window and his Davis Cup captain promised to buy it for him if he won an important upcoming match. He never got the bag, but U.S. sportswriters took up the name because it described his style on the court. The company was founded in 1933. Bernard Lacoste presided over its international expansion and added women's and accessory lines to the company's sporty look. Bernard Lacoste, born in Paris on June 22, 1931, handed over the reins of the company to his younger brother Michel in September but remained "honorary president." He is survived by his wife, Sachiko, and three children from a first marriage.